This title is directed primarily towards health care professionals outside of the United States. 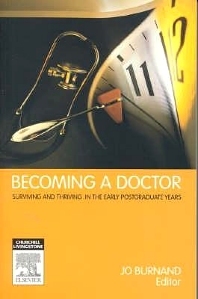 Becoming A Doctor: Surviving and thriving in the early years covers a range of professional, psychosocial and training issues that new graduates of medicine encounter during the first 2-4 postgraduate years. In making the transition the between medical school and medical practice the junior doctor will face a number of personal professional challenges and this book is designed to offer practical tips on managing clinical responsibility and decision making, career development, specialty colleges and training programs; the internship process; medico-legal and ethical considerations as well as self-care and finding and developing support networks in the early years. Whilst its focus is on Australian and New Zealand medical graduates, the book will also be a useful guide for overseas trained doctors preparing for AMC examinations, Directors of Clinical Training and those involved in mentoring new graduates.